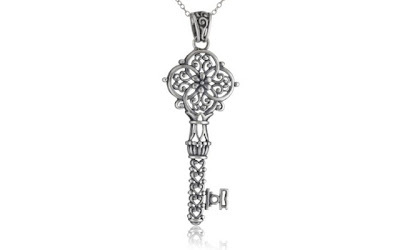 This Sterling Silver Filigree Key Pendant, 18" is currently selling for just $22.99 on Amazon.com! You will be saving 76% off the listed price of $94.99 with this jewelry deal. What I like about this necklace is how intricate the filigree is from the bale all the way to the tip of the key. Also, the pendant is the perfect size at just over 2" long.